Across the aisle from me at the TNNA show was a booth for Kalamazoo Knits, manned [personned?] by two lovely ladies named Diane and Erica. During lulls in the traffic, we would kind of drift across the aisle and chat with each other. As I was examining their booth, I noticed a skein of really brightly colored Lorna's Laces. I asked them what that was about (they're a pattern company), and Diane explained that it was from a dyeing workshop she does in the Kalamazoo area. 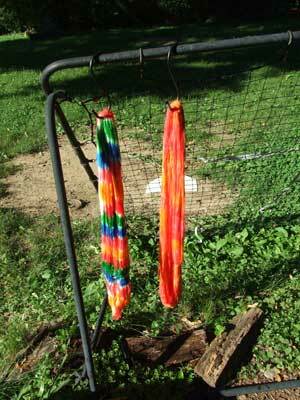 They had a sock knit from the dyed yarn hanging up and the colors were ka-pow-ey! 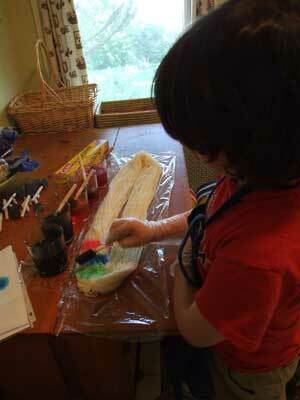 The secret to the color intensity is that they use Wilton Cake Icing dye. It's gentle and kid-friendly, but with much more intense colors than Kool-Aid. 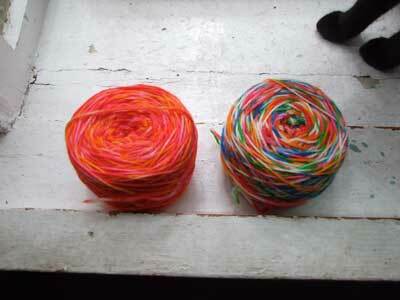 Here are the two skeins, dried and wound and ready to get knit into something fabulous! I can't recommend this method highly enough. 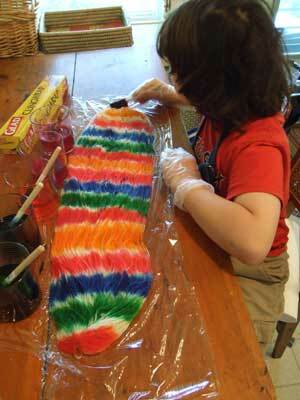 It was just as easy as Kool-Aid, but the colors - whoa! It's extremely kid-friendly if you want a fun summer project. 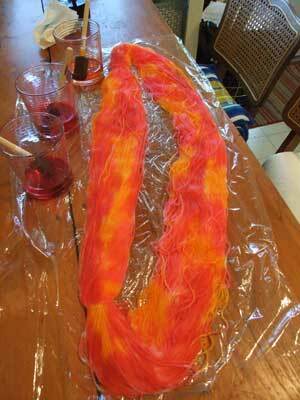 I have a bunch more undyed yarn and plenty more icing dye. I saw the cake coloring on your table this weekend and wondered what it was for! I LOVE the pink and orange together! OOOH... cool looking yarn + cupcake icing... a combination to beat all combinations! I'm all in on this tip! cg - oh it will work with corgi hair - let the madness begin!! 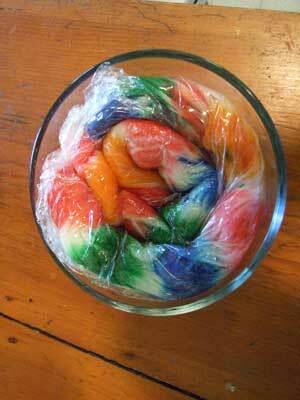 jjp - c'mon - you know you want to....dyeing doesn't count, like spinning doesn't count. You're MAKING yarn, not knitting it.